Archivo Cero (Zero File) continues travelling across the country. Its latest stop was at the Manga Comic Hall in Alicante. This particular engagement was huge in spite of the fact that the event itself didn´t have the greatest turnout. 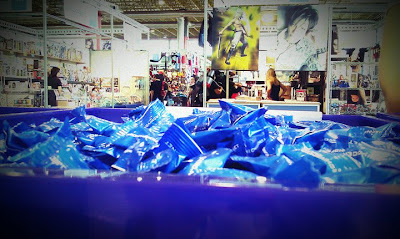 Eva Aldea told us that they were able to promote the series with some 7000 teenagers and young adults to whom they passed out the now well-known Archivo Cero bracelets and their corresponding candies. Our animated comic series continues to gain success among Hall of Comics attendees. Everyone is enjoying Archivo Cero and the messages in the Archivo Cero Facebook page continue to be very positive. During this presentation in Alicante, Marc and Eva had the help of the Q university group (Agape Campus´ university ministry in Valencia) who were able to host the tables and assist the many visitors that stopped by.